In Quantified, Whitworth draws lessons from the world’s most tech-savvy, high-impact organizations to show how we can make real gains for the environment. The principles of his approach, dubbed quantified conservation, will be familiar to any thriving entrepreneur: situational awareness, bold outcomes, innovation and technology, data and analytics, and gain-focused investment. This no-nonsense strategy builds on the inspirational environmental work begun in the 1970s, while recognizing that the next economy will demand new solutions. As President of The Freshwater Trust, Whitworth has put quantified conservation into practice, pioneering the model of a “do-tank” that is dramatically changing how rivers can get restored across the United States. The stories in Quantified highlight the most precious of resources—water—but they apply to any environmental effort. Whether in the realm of policy, agriculture, business, or philanthropy, Whitworth is charting a new course for conservation. "Quantified is a blueprint for fundamentally changing the nation’s approach to conservation." "If you believe in audacious, courageous and leapfrog solutions to save the planet, this book is for you. It's not just for environmentalists but for philanthropists and anyone brave enough to stand up and be accountable for real impact." "Quantified provides an analysis of why old models aren't working and how we can each play a role in optimizing for a shared and durable prosperity by rigorously quantifying benefits for all stakeholders." "A clear-eyed view for how business should think about the critical resource of water in the coming century." "Quantified reveals our mounting water issues as dire, important, and solvable." "From investment to governance to conservation, this book lays out a path that very few knew existed." "By shifting away from procedure-based conflicts to outcome-based solutions, Quantified describes a paradigm that can work for production agriculture and the environment." Conservation has hit a wall. Traditional tactics used over the last quarter century are proving inadequate against the demands placed on our freshwater ecosystems. Right now, more than half our nation’s waters are impaired. While we have all the ingredients for success: willing landowners, well-intended agencies, capable locals and millions of dollars of annual investment, we are not gaining ground at the pace and scale that’s desperately needed. On April 13, Joe Whitworth, author of Quantified: Redefining Conservation for the Next Generation, patented inventor and president of The Freshwater Trust, will draw lessons from the world’s most tech-savvy, high-impact organizations to show how we can make real gains for the environment. The principles of his approach, dubbed “Quantified Conservation,” will be familiar to any thriving entrepreneur. This no-nonsense strategy builds on the inspirational environmental work begun in the 1970s, while recognizing that the next economy will demand new solutions. More details here. RSVP by April 8. Google, Apple, Amazon, Uber: companies like these have come to embody innovation, efficiency, and success. How often is the environmental movement characterized in the same terms? Sadly, conservation is frequently seen as a losing battle, waged by well-meaning, but ultimately ineffective idealists. 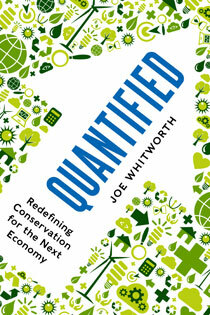 Joe Whitworth, author of Quantified: Redefining Conservation for the Next Generation, argues it doesn’t have to be this way. In fact, it can’t be this way if we are to maintain our economy, let alone our health or the planet’s. Presented by the Kinship Conservation Fellows Kinship Webinar Series. Check out Joe's Tedx Portland talk below and get inspired. The Yale Center for Business and the Environment has a conversation with Joe Whitworth. KATU AM Northwest. Watch here. Sierra Club Radio. Listen here. We asked our authors: In today's age of slacktivism, has Earth Day become meaningless as a way to make impactful environmental change? Check out what Joe S. Whitworth, author of Quantified: Redefining Conservation for the Next Economy had to say below. I wrote a blog on Huffington Post a few years back about Earth Day being an opportunity to take stock of where we are headed. April 22 is not a moment to celebrate the wonder of this unique planet. It’s an opportunity to recognize what next steps we need to take to secure a better future. Modern environmentalism is in need of a major overhaul. Despite some progress over the past generation, the majority of today’s environmental groups have been using the same set of tactics that have been used since the environmental movement took hold in the 1960s and 1970s. As result, environmentalists are obtaining an even smaller return on their investment. Today, there are more than 15,000 environment and animal public charities in the United States, compared with just a few hundred in 1970. Membership in U.S. environmental organizations has more than tripled, from 5 million in 1981 to 16 million. In addition, revenues have climbed to nearly $15 billion, and Earth Day has grown from 20 million participants at its launch in 1970 to a worldwide movement that attracts more than 1 billion people each year. Despite all advocacy, legal victories, and public and private funding that have been funneled into environmental efforts, we have an overwhelming amount of evidence that we’re not getting the type of return on investment that will secure a cleaner, greener future for decades to come. In the same way that many of us take a step back once in a while to evaluate whether we’re accomplishing our personal goals, it’s important for the environmental movement to assess its effectiveness. What results have we been getting? Where have we been successful, and in what areas can we improve? Smart businesses remake themselves all the time—and for modern environmentalism, such an assessment is long overdue. We need to stop focusing on actions taken and more on outcomes received. Because we live in a world of instant gratification, it’s easy for “slacktivists” to support a number of causes without tracking that support back to a difference actually made for the environment. Imagine that a sizable chunk of the $15 billion in annual U.S. environmental nonprofit revenue were instead spent on restoration programs tied to measurable improvements for the environment. Certainly, we would see many more gains for the environment than what’s currently taking place. To determine how to spend one’s efforts, Google’s Larry Page suggests asking the threshold question, “Am I working on something that can change the world?” This same question could and should be tweaked for “slacktivists” supporting environmental efforts. Am I supporting something that will really make a measurable impact? At The Freshwater Trust, we build all our river restoration work around an approach called “quantified conservation.” We believe if it’s worth doing, it’s worth measuring. Quantified Conservation is about ensuring every restoration action taken translates to a positive outcome for the environment. It’s about methodically tracking the ways in which our restoration actions will improve water quality and quantity. We use 21st century tools and technologies to measure baseline ecosystem conditions, model the water quality benefit associated with the restored conditions, and monitor environmental gain over time. This approach will ultimately allow us to better target investments in nature and fix more rivers faster. We’re able to exactly identify how many pounds of phosphorus and sediment were prevented from entering rivers, how many gallons of water we kept in rivers that needed it, how many feet of habitat we restored for native fish and more. So is Earth Day meaningless? Not if it forces us to take stock and recognize that we do not need 10% improvements for the environment—we need 1,000% improvements. Not if it brings us to a recognition that we need to be more adamant about tracking and measuring our environmental progress and outcomes, and not if it draws attention to those environmental groups that are moving the needle, doing 21st century conservation and having a true, quantifiable impact on the finite resources we all rely upon. Joe Whitworth has been responsible for the strategic direction of The Freshwater Trust, a nonprofit river restoration organization, for more than a decade. A sought-after speaker, he hosts the podcast Freshwater Talk, has been interviewed by Forbes, spoken at Social Capital Markets, and done a TEDx talk. Whitworth also blogs for Huffington Post, has authored op-eds and columns from Iowa to Oregon, and has been published in both popular and technical journals. He is a patented inventor and an advisor to B Corps, foundations, and governments.